Please complete this form to the best of your ability. This will make the process much smoother and provide us with the insight necessary to meet and exceed your expectations. 9. What are the aspects of your job that you most enjoy? 10. What are the aspects of your job that you most enjoy? 11. Anything else that you feel is important enough to mention. Example: Charitable contributions, other highlights or any additional info you feel is relevant. 4a. Do you have any of the following materials to use in the design? 5. Who will be providing copy for the website, or do you need copywriting services? 6. Who will be providing photography for the website, or do you need photography services? 7. Please check the box for any of the elements that you would like? 1. Are there any specific colors that you would like to use? 2. 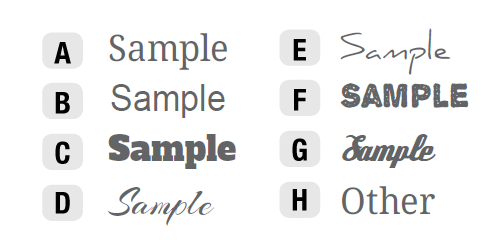 What type of font below do you prefer? 4. Are there any specific styles or elements that you do NOT want? 7. What time frame or deadline do you have in mind for the finished product?